Marshmallow Peeps make this cake a real stunner for Easter. Just back from South Carolina and tasted this wonderful cake at Kaminsky’s Dessert Cafe in downtown Charleston. 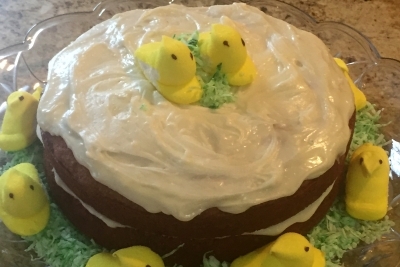 While I added some “peeps” and coconut for Easter, it is a cake for all seasons! If you are ever visiting Charleston, be sure to stop at Kaminsky’s, located at 78 North Market Street in Charleston, South Carolina. Grease and flour a Bundt pan or 2 9-inch round pans. Beat eggs with oil and sugar, then add the pineapple. Fold in dry ingredients and banana chunks. Bake for 1 hour 10 minutes in Bundt pan or 28 minutes in 9-inch round pans. Cool in pan and remove.